Panama carries the claim of being the first part of the mainland Americas to be colonised, in 1502, albeit with a short-lived garrison of eighty men. The region was reoccupied on a permanent basis in 1519 when Panama City was founded. It was initially administered as part of Peru, but in 1717 the province became part of the viceroyalty of New Granada. Shortly before that, the site of the original colony was the location for the ill-fated 'Darien Venture' Scottish colony. To the south of New Spain, Panama City was founded on 15 August 1519 by the Spanish governor of Castillo del Oro, the colony's name until 1529, when Panama was used instead. The earliest explorers encountered a native ruler near the Bay of San Miguel in 1522 called Biru. They initially used this name for all of their subsequent conquests to the south - Peru. The area that later forms the location for Panama City is first discovered by Rodrigo de Bastidas in March. Following his reprieve by the Castilian king, and surviving storms which drown the governor of Hispaniola and sink the first Spanish treasure fleet to leave the Americas, Christopher Columbus arrives on the coast of Panama on his fourth voyage at the very end of the year. A garrison is established at the mouth of the Rio Belen (Belen meaning Bethlehem), and is named Santa Maria de Belen, the first Spanish settlement on the mainland of the Americas. Columbus places his brother in charge. First Castilian governor of Santa Maria de Belen. Columbus leaves the garrison, only to become stranded on Jamaica for a year. Taking advantage of his absence and that of his ships, the native tribes attack the small outpost and its eighty-man garrison. They are forced to retreat to the shore where they are eventually rescued, but the outpost is permanently abandoned. First Castilian governor of Darien. From Hispaniola, Vasco Nunez de Balboa founds the first successful settlement on the mainland. 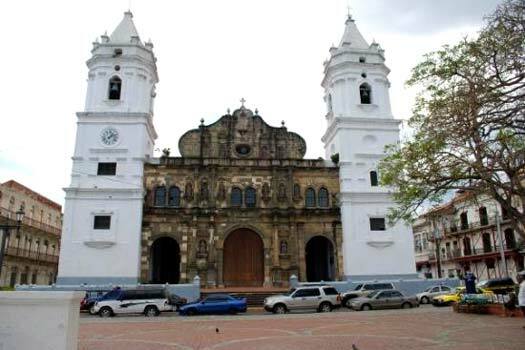 Santa Maria la Antigua del Darien is founded on the coast (modern Darien, between Panama and Colombia). Vasco Nunez de Balboa and Francisco Pizarro (later governor of Peru) cross the Isthmus of Panama, leading the first European expedition to see the Pacific from the west coast of the New World. Once there, Balboa claims the Pacific Ocean and all the lands adjoining it for Castile. 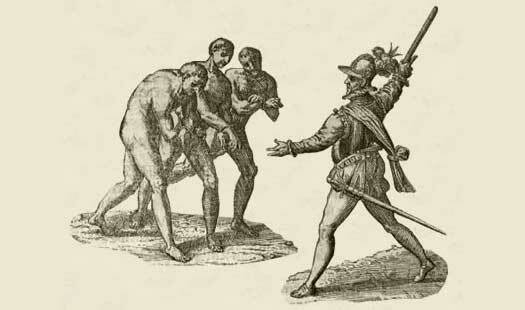 Pedrarias Davila arrives from Castile along with Hernando de Soto, explorer and governor of Cuba from 1538. First Castilian / Spanish governor of Castillo del Oro. Panama City is founded on the American mainland by the Spanish governor shortly after he takes control after leaving Hispaniola. This is the first permanent settlement in the region since the destruction of Santa Maria de Belen, but Darien is abandoned as a result, and is subsequently sacked and burned by native peoples. Four expeditions are undertaken by Francisco Pizarro to conquer Peru from Panama City. He eventually defeats the native Inca peoples and gains himself the titles of governor and captain general of New Castile. Meanwhile, Pedrarias Davila sends Francisco Hernandez de Cordoba to conquer the province which forms modern Nicaragua. Removed after mishandling his post. First Spanish governor of Panama. Also governor of Puerto Rico. The Real Audiencia governs Panama until a new governor can be appointed. Did not take up office. Interim governor who declined the office. 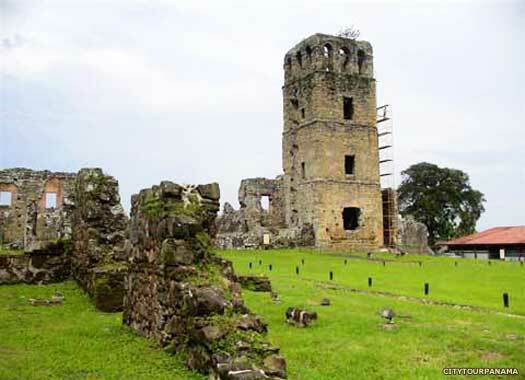 Panama City is rebuilt eight kilometres (five miles) to the south-west of the old city, and eventually grows up to surround the ruins (which remain a tourist attraction today). Governor during the initial stage of the Darien Venture colony. Scottish settlers make landfall in Panama, establishing the ill-fated 'Darien Venture' colony. The disaster that it becomes barely makes any kind of impression on Spanish Panama. Governor during the later stages of the Darien Venture colony. Along with a vast swathe of the northern territories of Peru, the province becomes part of the viceroyalty of New Granada. Freed of Spanish colonial control, the viceroyalty of New Granada becomes the United Provinces of New Granada. The governor is forced to take refuge at Portobelo in Panama. The United Provinces of New Granada is re-conquered by Spain and the viceroyalty is re-established. The republic of Gran Colombia is formed after the fall of the Spanish administration of the colonies. Immediately the new administration of Panama, under Colonel Jose del Fabrega, opts to join the republic. The republic of Gran Colombia was formed on 28 November 1821 after the fall of the Spanish administration of the colonies. Immediately the new administration of Panama, under Colonel Jose del Fabrega, opted to join the republic after elements in the province made it clear that they wanted nothing more to do with the colonial administration. A military governor oversaw the changes and the first republican governor. Fighting a nationalist war of independence in Peru, the Spanish vice-regents are defeated and agree to leave Peruvian territories. 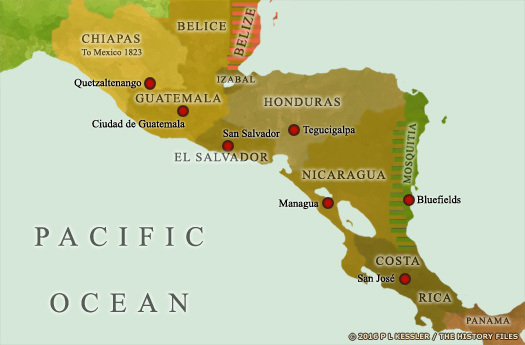 In 1822 the Mexican empire is formed on Panama's northern border. The Gran Colombian state disintegrates, but Panama remains within the republic of New Granada. In July, General Juan Eligio Alzuru proclaims the independence of Panama from Gran Colombia, but under Colonel Tomas Herrera, Gran Colombia's military forces defeat and execute Alzuru and forcibly reincorporate Panama. Herrera himself serves as Panama's governor in 1831. New Granada's military governor. Returned in 1840. Former military governor. Returns in 1845. Third term of office. Returns in 1849. The signing of the Bidlack Mallarino Treaty between New Granada and the USA ensures that Panama will remain within the republic, with both parties joining together to put down liberalist attempts to create an independent state, and with the USA gaining rights to build railways and roads through the isthmus in return. Fourth term of office. Returns in 1851. Fifth term of office. Returns in 1852. Sixth and final term of office. Acting governor in his second term of office. Governor after acting as provisional head of state. Provisional governor in his fourth term of office. Presidents replace governors for much of the period in which the provinces of Colombia are organised as sovereign states within New Granada itself. The Thousand Days War ignites between Colombia's Liberal and Conservative political parties (which naturally includes Panama as part of its territory), when the latter are accused of retaining power through rigged elections. The Liberals are defeated, but the Conservatives also lose their appetite for the conflict, and peace is regained with the signing of a treaty in 1902. To achieve its own ends, the USA supports Panamanian demands for independence from Colombia and in 1903, the isthmus separates and becomes the republic of Panama. Located in Central America, the republic of Panama is the most southerly country in the Central American region. It borders Costa Rica to the north, and Colombia to the south, with a clear line across the Caribbean to Cuba, Haiti, and the Dominican Republic to the east, and the Pacific Ocean to its west. Its capital is Panama City, which was founded on 15 August 1519 by the first Spanish governor of Panama. Its population in 2011 was about 3.6 million. The province of Panama was incorporated into New Granada in 1717. This became the United Provinces of New Granada in 1810 following various wars of independence which broke out across the Spanish Americas. Peru served as a centre for the royalist opposition to these revolts. The viceroy, Abascal, reincorporated the provinces of Chile, Cordoba, La Paz and Potosi (both in modern Bolivia), and Quito (part of New Granada). Spanish governors remained in nominal command of Granada, but in opposition to the United Provinces, and 'governing' from Panama. Panama subsequently went through a bewildering array of changes until the final break-up of former Spanish imperial territories. Panama remained part of Columbia, although it twice tried to achieve independence, in 1831 and 1840-1841. In 1902, the USA, which had helped Colombia to suppress any uprisings in Panama between 1846-1902, decided to take control of and complete the abandoned French work on the Panama Canal. The Colombian government was naturally reluctant to allow that level of control to fall outside its hands and refused permission. The US decided to support Panamanian demands for independence and in 1903, the isthmus separated and the republic of Panama was born, with a small US military force preventing Colombia from sending troops by sea to regain their province. Encouraged by the USA, Panamanian independence from Colombia has been demanded and granted. Now the US is free to start work on the abandoned French Panama Canal project, work that had previously been blocked by Columbia. A huge force of migrant workers from many different countries is brought to Panama to work on the canal and many of them die of diseases such as yellow fever. Workers include West Indians, Indians and Chinese. The USA signs a treaty with Panama that gives the former country sovereign rights over the canal. 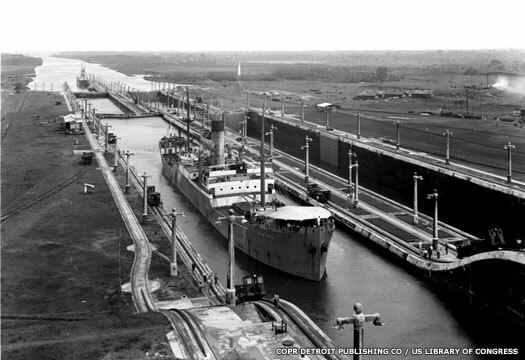 The Panama Canal is opened for business by its US builders and owners, despite it having been signed over to them by a French citizen in Panama in 1903 who had no authorisation to do so. Journey time through the canal by passenger-carrying vessels is approximately eight hours, and its existence makes Panama a name that is known around the world. The official opening by President Woodrow Wilson takes place on 12 July 1920. In December 1917, Panama declares for the allies in the First World War against Germany and the Austro-Hungarian empire, but takes no active role in the conflict. Arnulfo Arias, leader of the nationalist Patriotic Communal Action organisation, leads a coup which deposes the country's liberal president, Florencio Harmodio Arosemena. The next year he helps his brother, Harmodio, to become president. Arias' main aim is to weaken US influence on Panama and organise the country on lines that are closer to those of Nazi Germany. Now that Panama is no longer a US protectorate (from 1939), Arnulfo Arias becomes president. Unfortunately for him, he displays such strong pro-fascist sympathies that the USA supports a coup that deposes him in 1941. Shortly afterwards, Panama joins the Second World War as an ally of the USA and Great Britain on 7 December 1941, against Japan, Germany and Italy. Again standing for election in 1948, Arnulfo Arias is defeated. However, in the following year the National Assembly declares him to be the winner. He suspends the constitution and rules by secret police force. This time his regime lasts until he is again overthrown in 1951. The issue of US ownership of the Panama Canal has long been contentious, but on 9 January it reaches boiling point on what becomes known as Martyr's Day. 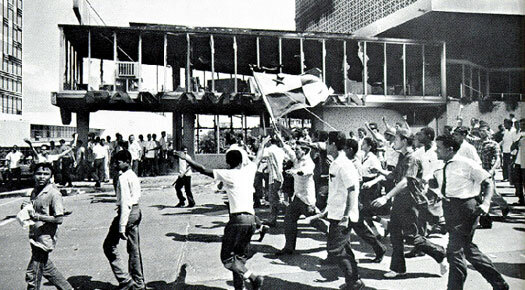 The riots start after a Panamanian flag is ripped during a dispute between the Canal Zone Police and Panamanian students about flying the flag alongside the American stars and stripes. Three days of fighting follow, with the US military becoming involved in regaining control of the canal. With US support, a coup led by Lieutenant Colonel Omar Torrijos and Major Boris Martinez topples the government of the recently elected president - Arnulfo Arias in another attempt to secure power - and controls the country as a military dictatorship. This ends the constitutional democracy that has existed in the country since 1903, ironically at the hands of one of the most vocal supporters of democracy. A power struggle between the coup's leaders results in Martinez being exiled in 1969 while Torrijos becomes Panama's dictator. Military dictator. Died in an airplane accident. The US and Panama agree the Torrijos-Carter Treaties which will eventually return ownership of the Panama Canal to Panama itself. The following year Torrijos steps down as the head of the government but retains power behind a puppet president. Under pressure from the US to do so, he plans to return the country to democratic rule for 1984, but his death halts those plans and Panama's presidents are controlled by a series of military rulers. Military dictator. Enforced retirement in 1982. A military coup against Aguilar by Colonel Ruben Dario Paredes forces the county's second dictator to retire from office, leaving the way open for Paredes to become its third dictator. Paredes retires as part of an agreement with the chief of staff, Manuel Noriega, which will allow him to become the next 'president'. Noriega fails to fulfil the agreement when he becomes the country's military leader. Instead he profits from his position by drug trafficking, laundering money, and engaging in organised crime. The National Guard is reorganised into the Panama Defence Forces, and is greatly increased in terms of men and arms. Military dictator. Deposed by US invasion. Standing in yet another election, Arnulfo Arias, with the prospect of a landslide majority in his favour, is blatantly robbed of his win by Manuel Noriega, who pronounces that his own puppet candidate has won with a slim majority. 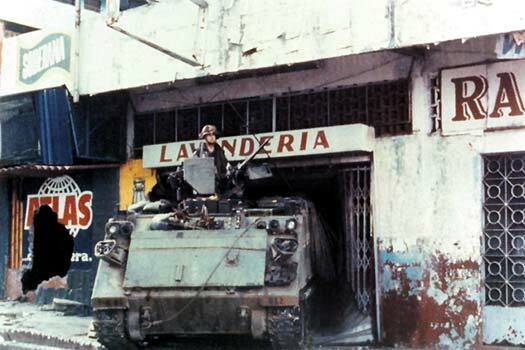 Shortly after Manuel Noriega is indicted in the USA for drug trafficking (in 1988), American troops invade Panama on 20 December 1989 and remove him from office. He takes refuge in the Vatican diplomatic mission in Panama City. The US place intense diplomatic pressure on the Vatican mission and blast the building day and night with extremely loud rock-and-roll music, just to make sure. Noriega finally surrenders on 3 January 1990. He is detained as a prisoner of war and is tried for his various offences. Parliament approves constitutional reforms, including the abolition of the standing army. Privatisation begins to remove assets from state control. Mireya Moscoso, the widow of Arnulfo Arias, becomes Panama's first woman president. This is despite (and perhaps because of) a campaign to discredit her by the opposition based upon her late husband's unproven collaboration with fascism. On the very last day of the same year, as part of the Torrijos-Carter Treaties, the US hands full control of the Panama Canal to Panama. In May, Martin Torrijos, the son of former dictator Omar Torrijos, wins the presidential elections. As one of her last actions in the post, in August-September President Moscoso pardons four Cuban exiles which Havana had accused of plotting to kill Cuba's President Castro. Angry at the pardons, Cuba severs ties with Panama. Newly-inaugurated President Martin Torrijos pledges to repair relations, and in November both countries agree to restore ties. A free trade agreement with the US is negotiated in 2006 but its implementation is held up pending approval by the US Congress (not granted until 2011). Noriega's prison sentence in the USA is completed in 2007, but pending the outcome of extradition requests from both France and Panama he remains in prison. France is granted its extradition request in April 2010. Noriega arrives in Paris on 27 April 2010 and, after a re-trial as a condition of the extradition, he is found guilty and sentenced to seven years in jail in July 2010. A conditional release is granted on 23 September 2011 for Noriega to be extradited to serve twenty years in Panama. He returns to Panama on 11 December 2011 where he is imprisoned in the El Renacer prison facility for crimes against Panamanians that were committed under his rule.